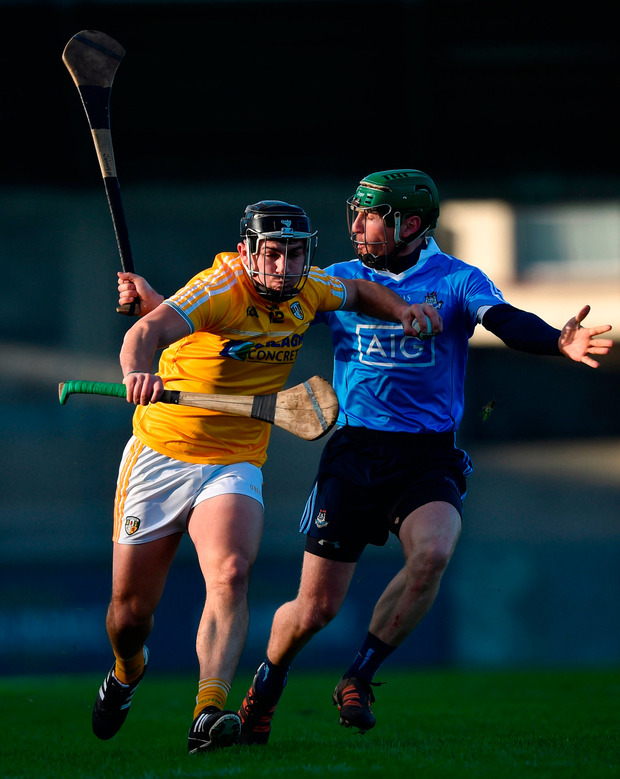 Given Tipperary had trimmed them by 17 points just 24 hours previously, Dublin's start to yesterday's Bord na Mona Walsh Cup clash with Antrim in Parnell Park didn't bode well. A team containing 11 of those who started in that challenge-match defeat to Tipp (which, at least, saw the return of Danny Sutcliffe), Dublin laboured to a 0-5 to 0-0 deficit after just seven minutes. "We had a few silly mistakes in that first 10 minutes but that was a good sign of character," reckoned Pat Gilroy afterwards from the safety of a 4-16 to 0-17 victory, one which will bring Davy Fitzgerald and his Wexford team to Parnell Park for a semi-final next Sunday. "We conceded five and then scored 2-9 to 0-4 in the remaining part of the first half," said the Dublin manager. Gilroy is still locked in experimental mode but there were a few bright sparks on an unseasonably sunny January afternoon in Donnycarney. Alan Moore, the speedy St Vincent's inside forward, scored 2-1 and played an important role in Dublin's second goal, a strike from Paul Winters after Moore's shot rebounded off the crossbar. Earlier, Paul Crummey applied the jump-leads to Dublin's battery with their first points of the game, a goal after eight minutes and a score that provided them with energy. Gilroy's team stitched the next five points of the match together and but for some rustic January tackling, could have been out of sight by half-time. 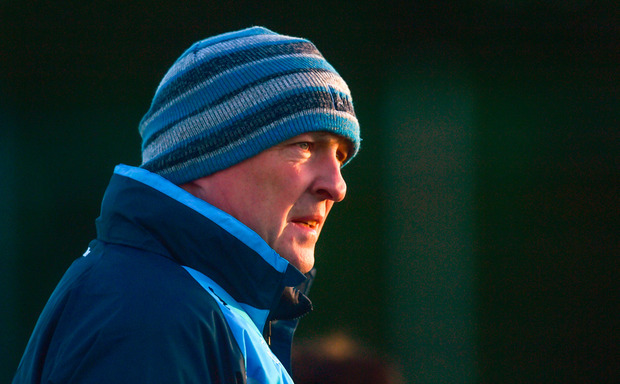 "We gave away 21 frees today, which is far too many," the new Dublin hurling manager pointed out. 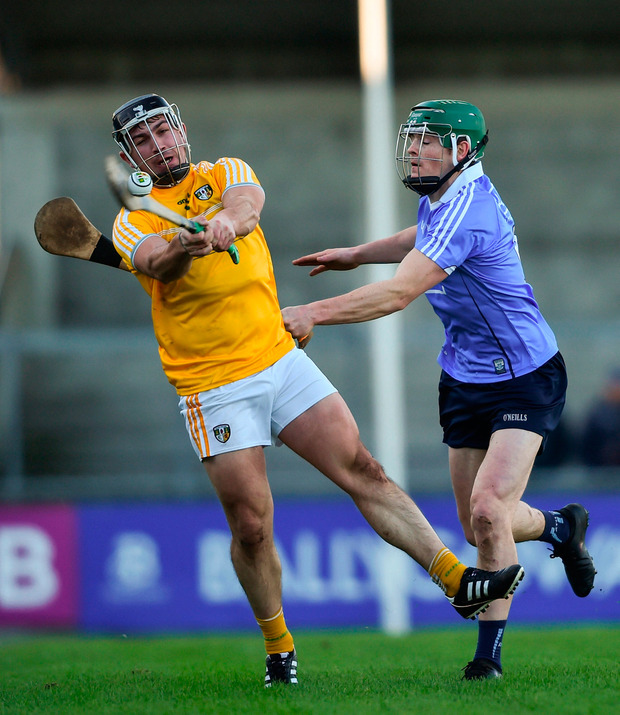 Of those 21 frees, Antrim used 12 to score the majority of their 17 points, with Neil McManus converting 11. "We have to improve on that. But you couldn't fault the effort. "We played a game yesterday as well. So it was very encouraging to see… it's January and fellas are mad for action. But that bit of indiscipline on our tackling is something we need to work on." Gilroy could also reflect happily on the performance of a rookie full-back line, the accuracy of Robbie Mahon (0-6) and the thoughtful distribution of Shane Barrett and Johnny McCaffrey on a day when legs became leaden and the intensity dropped with the sun. "We've put a good workload on them this week," Gilroy added. "And to get that sort of effort out of them today… you're going to make mistakes out there when you're working that hard but it's great to see the effort." 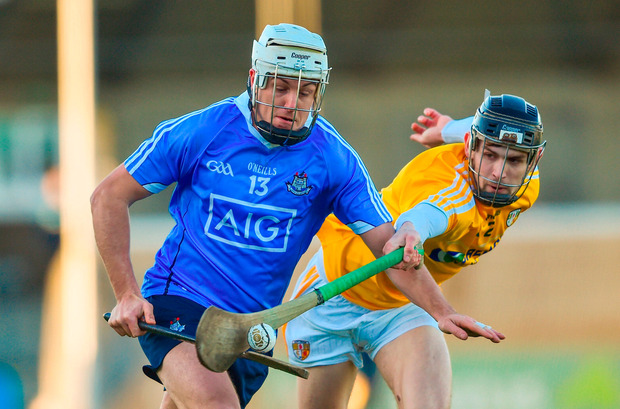 SCORERS - Dublin: A Moore 2-1, P Winters 1-4 (0-3f), R Mahon 0-6 (2f, 1'65), P Crummey 1-1, D Gray 0-3, J McCaffrey 0-1. Antrim: N McManus 0-11 (10f), C Johnston 0-2, N Elliott, G Walsh, C McCann, C Clarke (f) 0-1 each. DUBLIN - G Maguire; P Smyth, B O'Carroll, C Hendricken; S Barrett, D Kelly, C Crummey; J McCaffrey, T Connolly; C Costello, D Gray, P Crummey; A Moore, P Winters, R Mahon. Subs: R Smith for Connolly (26 inj), C McBride for Winters (44 inj), S Ó Riain for P Crummey (49), C Ryan for Costello (51). 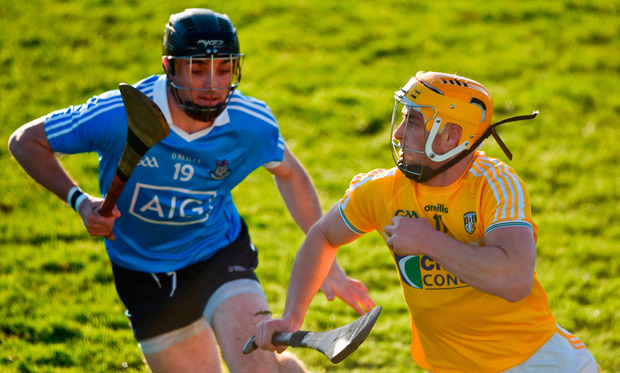 ANTRIM - C O'Connell; D Kearney, A Graffin, S Rooney; C McKinley, J Maskey, J Dillon; N McManus, C Johnston; N Elliott, G Walsh, C McCann; J McNaughton, C Carson, C Clarke. Subs: E O'Neill for Carson (41), J Connelly for Clarke (51), M Connolly for McCann (57), C Boyd for Dillon (65), D McCloskey for Elliott (71).